Newsweek prompted a wave of indignation and mockery from the left a few months back when it published a cover with the caption MUSLIM RAGE in the wake of riots over the YouTube-posted trailer for "The Innocence of Muslims". The responses I saw offered no specifics, apparently considering the offensive absurdity of the notion of "Muslim rage" so self-evident that it required no explanation, but as far as I could tell the core of the complaint was that not every Muslim on the planet was outraged—so this overly-generalized caption was clear evidence of Newsweek's anti-Muslim bias* (just as the use of the blanket phrase "Los Angeles Riots" back in 1992, despite the relative peace in areas like Echo Park and Brentwood, established once and for all the media's anti-Angelenoism). An Egyptian court ordered YouTube to be blocked for a month after the website disseminated video footage deemed offensive to Islam and the Prophet Mohammed, the state-run Middle East News Agency reported, citing Administrative Court Judge Hassouna Tawfik. [...] YouTube, “did not respect the belief of the millions in Egypt and it overlooked the state of rage that prevailed amongst Muslims,” it said, citing court documents. Huh. Well, once the Egyptian judiciary is informed about how ridiculous this whole "Muslim rage" notion is I'm sure they'll not only retract their offensively Islamaphobic sentiments, but will also overturn the death sentences they've imposed on seven Egyptians involved in the production of the film. One of the capital crimes for which those people were convicted, by the way: "Using religion to promote extremist ideas." ADDING: The Egyptian court also transgressed against the permissible narrative when it suggested any meaningful connection between the film trailer and the so-called "rage"; the mere suggestion that these outbursts of violence and anger are caused by seemingly obvious triggers like Koran-burning or crappy-film-trailer-distributing provokes scorn from many on the left, who blithely ignore statements like the one(s) above, Muslims who say outright that "We cannot accept any insult to our prophet...it's a red line" or "We did the protest to show to the infidels that we are unhappy about their action in burning our holy Koran in America," etc. In ideology as in theology, reality is rarely an impediment to belief. * Newsweek wasn't alone in this ugly bias, though; the well-known Muslim bashers at the Daily Times of Pakistan ran a story titled "New blasphemous caricatures fuel Muslim anger." Commenters who react to the infrequent spam filter glitches by screaming "Censorship!" and spreading conspiracy theories about mass "censorship" will also be banned from commenting on the site. Almost too perfect, isn't it? Has CommonDreams maintained this impressive 10% rate of censorship? Does a 10% deletion rate make them the most aggressively censoring news and opinion site on the Internet? And do the little Napoleons there ever feel even a twinge of conscience as they go about their shabby work? So many uninteresting questions we'll never have answers for. Who will win tonight's debate: black Romney or white Romney? Unwitting kabuki fans everywhere are feverish with anticipation. I can't tell you how tired I am of bringing up my news page in the morning only to be greeted by the stare of yet another remorseless mass murderer: Anders Breivik, Jared Loughner, Barack Obama,Wade Michael Page, etc. If you haven't already, odds are good you're going to have someone point you to this wretched bit of Obamaphilia in the next few months (I warn you that clicking through may cause nausea, vomiting or uncontrollable seizures). The first time I saw that I thought that someone really needed to put together a corrected version—and happily, someone did (thanks, the Internet!). Bookmark it now and you won't have to track it down later when some Democratic hack coughs up that first link. I checked in to the hostel in Jerusalem, feeling a bit adrift and melancholy. Everyone I had been traveling with up to that point had either left or had drifted off to other areas, and there were few internationals in the hostel that early in the afternoon. I was just thinking about going out for lunch when I decided to give Huwaida Arraf of the ISM a quick call, to see if there were any actions planned in the next few days. She said there was an action planned, at the Church of the Nativity, but not in the next few days—they were set to head out to Bethlehem in two minutes. I blanched. It would be a 15-minute walk at least to where the buses were staging, and I really did need to take a day off; would it even be worth trying to make the walk? I told her I would try, but in fact I was still trying to make up my mind about it. Then my conscience kicked in. This was exactly why I'd come to Palestine, and I'd been hoping to be involved in an action at the church ever since I'd arrived. The Israelis had put the church under siege in the first days of their invasion after some Palestinians sought refuge there, and they had maintained the siege over the protests of the international community and the Catholic Church. The people inside—including nuns, priests, and monks in addition to the Palestinians—were running out of food and water, and the situation for them was desperate. Israeli snipers had killed several people in and around the church, including the bell ringer. The people trapped in the church needed whatever help they could get. So I threw my things back into my bag and headed over to Jaffa gate, fully expecting that they would be gone by the time I got there. But they weren't—the buses were just filling up with a good-sized group of internationals. I had made it in time. I didn't realize it then, but at that moment my fate was sealed. We headed over to Bethlehem and met up with more people near the Indymedia offices there. I was happy to see Jeff standing there—we had lost track of each other in Hebron, and it was good to be back together for this action. All told there were about 25 of us, and we began making plans for the action. 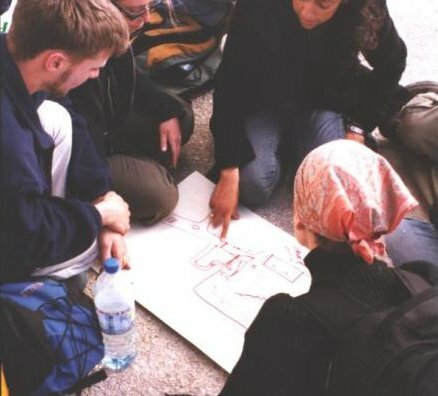 We would split into three groups: a group who would be trying to get inside to act as human shields for the people there, a "media" group, and a group which would act as support for the entry group. I was in this third group; our purpose would be to stand in front of the door, blocking the view of any Israeli snipers as the entry group made its way inside, so that the snipers would not be able to get a shot at anyone inside the church. All of us would be carrying food and water for the people inside. We set out south for Khan Younis early in the morning. 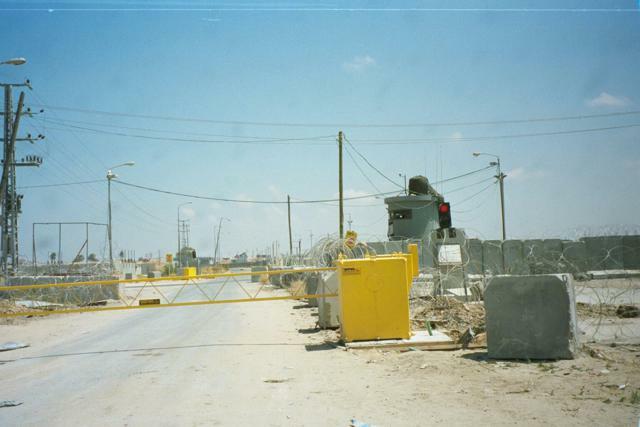 To get to Khan Younis we had to pass the Abu Houli checkpoint; like Erez, this was no makeshift checkpoint along the lines of those in the West Bank, but rather a fortified military position. Sniper towers were in evidence all around it. Abu Houli is one of the most notorious checkpoints in Gaza or the West Bank, and with good reason. It marks the intersection of the main Palestinian road in Gaza with an Israeli settler-only road, and priority is given to the Israeli settlers and military traffic. It is only opened twice a day for Palestinian traffic, once in the morning and once in the evening, and then for only an hour or so each time. Cars stack up, sometimes for up to two miles on either side of the checkpoint, filled with people waiting to pass to the other side of Gaza. The actual times at which it will be opened for Palestinians are unpredictable, and sometimes the Israelis do not open it at all. When that happens, Palestinians trapped there in the press of cars have a choice: try to walk back to their homes (assuming they're on the right side of the checkpoint, are within walking distance, and are in good enough health to do so), or sleep in their cars overnight and hope that the checkpoint will be opened in the morning. And all the while they are waiting, either choking on the constantly blowing sand and dust or sweltering in their closed cars in order to avoid it, they can watch Israeli settlers drive by at high speed along the settler-only highway. We were lucky to arrive in the morning shortly before Abu Houli opened; we would not be so lucky in the afternoon. The taxi driver dropped us off well short of the checkpoint and we had to continue on foot toward it. However, since everyone who goes through Abu Houli must be in a vehicle, we had to find cars or trucks along the way to take us through and drop us off on the other side. As always, it was no problem to find someone willing to help. We traveled back to Jerusalem, staying the night with a wonderful Palestinian family in Taibe and enjoying one of the best meals I could remember. We never lacked a place to sleep or something to eat. Other internationals told me how they would travel the countryside freely without concern for shelter, knowing that the Palestinians in the villages, towns, and even (especially) the refugee camps would be gracious and friendly and make sure they were accommodated. It is difficult to overstate the generosity of the Palestinian people, always willing to share what they have no matter how little that may be. Arriving in Jerusalem again, we all faced the choice of what we wanted to do next. The news had been filled with speculation about an imminent Israeli attack on the Gaza Strip (largely due to belligerent statements to that effect made by Ariel Sharon), and at the moment there were few or no internationals in Gaza to try to help if the attack came, so I felt that Gaza was the most important place to be. If the Israelis attacked, we could station ourselves in the refugee camps there to act as human shields, as other internationals had done throughout the Israeli assault on the West Bank. Jeff felt the same way that I did, but others in the group weren't yet prepared to head out on another trip and some were nearing their departure dates, so it would be just the two of us. Some of our friends were concerned for us; Gaza is essentially a huge concentration camp, incredibly densely populated, and they felt it could be dangerous for us to go. They also felt that unlike the West Bank, in Gaza the Israelis would not show as much concern for Western lives. These were all genuine possibilities and we certainly didn't know what to expect, but we did know how we would feel if an Israeli invasion happened and we had chosen not to go—especially because it would be impossible to enter Gaza after the start of an invasion, since the Israelis would doubtlessly close off any and all access. I met a few other internationals later who were going as well, and we agreed to meet up with them the next day and take the trip across Israel to Gaza. Even though we had only been together for a few days our group had formed surprisingly strong bonds, and it was a bittersweet goodbye. We promised to try to stay safe and return soon, and to meet them back here when we did. The next morning, with a now-familiar mixture of exhilaration and apprehension, we set off for the Gaza Strip. The route to Jenin was circuitous, to say the least. We had to go from Jerusalem deep into Israel, drive north, and then head back into the West Bank. It would have been much easier and (in a sane world) much quicker as well to drive directly north from Jerusalem to Jenin—but it was effectively impossible because we would have hit an endless array of Israeli checkpoints, one every few miles, any of which could have ended our trip. As we drove along I thought about what life must be like for the many Palestinians who have family and relatives in other towns. We re-entered the West Bank and drove the last few miles toward Jenin. We approached a makeshift Israeli checkpoint—really just an APC parked in the middle of the road, with soldiers stationed around it. They called in our identification and then denied us passage; when we asked why, they said they were just following orders. We drove away and approached Jenin from another direction, and again encountered Israeli soldiers along the road, but our luck was better this time—these were younger soldiers, more casual, and after a few questions they let us through. The taxi took us another mile or so and then dropped us off. We said our goodbyes to the driver, who now seemed like an old friend, and then we hiked a short way down a hill and across a soccer field to where another van was waiting to pick us up and take us into Jenin. We shared the ride with doctors from the group Physicians for Human Rights, just one of many humanitarian organizations that were coming to document the results of the brutal Israeli assault on the refugee camp. As we drove into town, the evidence of the invasion became apparent: utility and phone lines had been cut just outside the camp. On the walls and on the doors of houses, about every 10 or 15 feet, the Star of David had been spray-painted in black paint. Some of the stars had exclamation points or "#1!" written inside of them. The message of humiliation and control was clear; Israeli troops here had been marking their territory, making a racial and religious statement to every person in the town. Thoughts of Kristallnacht came unbidden to my mind, and the irony was palpable. The media had been in the Jenin camp for almost a week now, and I had followed the stories closely in print and on television, yet I had never seen or heard about these disgusting images. I wondered what the response would be if people around the world could see this for themselves.